I believe that those who live by the sword are more likely to die by the sword. Yet people who use the sword in defense of their version of ‘peace’ seem to prevail these days (Consider the fate of Hitler and Bin Laden as examples). 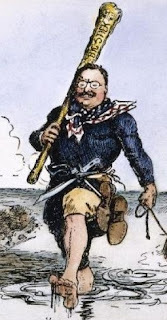 It seems the prudent thing to do is to ‘speak softly and carry a big stick’ (Theodore Roosevelt). Roosevelt’s policy has proven successful at the international and ‘Well Regulated Militia’ levels. On an individual level, however, most of us prefer a more ‘Civilized’ environment than the ‘wild west’ scenario where everybody is walking around literally carrying their ‘big sticks,’ ready to enforce their own personal version of ‘peace’. Most people keep their big sticks at home when they go out, trusting to the ‘Militia’ to enforce the public law. At home the big stick stands at the ready to defend against any immediate threat that might arise in that gap of time before the Militia can respond (or in case the established Militia fails to respond). Maybe ‘speak softly and keep a big stick in reserve’ might be a better characterization of today’s practical situation. If you need that crutch, I’m not interested in taking it away from you. But I personally believe that if you need that crutch you are judging your neighbor badly, and your choice may become self fulfilling. To return to the opening sentence, my personal position (which I don’t seek to impose on anyone else) is this: Because I believe those who keep big sticks in the house are not just physically, but also psychologically more susceptible to violence, both as victims and as perpetrators, I prefer a lifestyle free of such a threat; and I choose to associate with peaceful folk who are free of the ‘big stick’ mentality. That’s not to say that I won’t arm myself and use unyielding force if the situation calls for it – just try me (Matthew 26: 52-53).